All the disturbances must be leaned on for help in an attack for unity. We must discuss them in the group. The disturbances are undoubtedly useful, we need only to use them correctly. That way, we won’t return them, but will take a shortcut toward the goal. We must attack unity together, overcoming yesterday’s failures, rejoicing at them as preparation for ascent. Unity is the goal, attack is the means, and we are the executors. In the end, the Creator does everything when we will turn to Him in despair from all our failures. But we don’t have the will to bestow. We ask for it while being enslaved by the ego. We reveal that the #ego rules over us, and we are incapable of bestowal. Our efforts lead us to wanting to bestow, but we are incapable—and this begets despair and a plea to the Creator. Nothing I try succeeds. A scream appears, how do I act correctly? Spiritual despair that I cannot give contentment to the Creator. In truth, spiritual work is precisely to reach despair—that is the kli (vessel) for revealing the Creator. “A doctor is entitled to heal.” Although the Creator governs everything, we must also rebuke accusations by Kabbalah’s opponents at the degree of our world, while knowing that they’re being sent by the Creator. He arranges “help against us.” Through the thorns, to the Creator! -the Creator’s revelation in unity. When we strive for the Creator rather than comfort, our attitude to good and evil forces ceases to be different. We perceive both as coming from the Creator, and differentiate between them only in order to reveal the Creator, to rise above them and thus reveal Him more. In nature, there is no force of attraction without the force of repulsion. The 2nd force is usually concealed, but it surely exists. Hence, to reveal the good force, we must reveal the evil force, and vice-versa. Thus, “Love will cover all crimes”—only both, together forever! 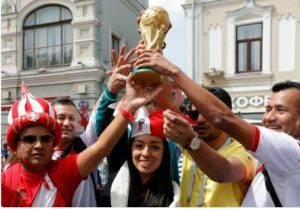 #FifaWorldCup2018 Just as the world cup brings humanity together, it also reflects all of humanity’s banes. If we truly want this event to do good for humanity, the first thing to do is take the profit motive out it. The greater the +, the greater the -, and R is revelation of the Creator. “Advantage of light is revealed from darkness” and advantage of darkness is revealed by light. They fight over man, two hold the tallit, until man reconciles them in the middle line. They grow relative of one another. By “rocking the boat” of international politics, Trump exposes the deceptive relations of “big politicians” and prevents even worse volatility, since the world leaders’ superficial unity is a facade for ego-ambitions that put the world at the brink of global catastrophe. It was nature’s way of planting the seed of unity for the entire human race. In other words, nature made a deal with them: making them a mini-model of global unity, which ultimately has to set an example for the world. 3,800 years ago in ancient Babylon, a special “deal” was made at the cradle of human civilization. Representatives from the various groups, tribes and clans decided to come together and coexist under the principle of unity above all differences. And specifically among Israel analysts: Will Trump be able to make a deal to solve the Israeli-Palestinian conflict? The Trump-Kim summit generated a renewed sense of hope along with questions about the future. Will we witness a new and peaceful North Korea? Will Trump’s deal-making skills become instrumental in promoting world #peace? The Trump-Kim summit generated a renewed sense of hope along with questions about the future. Will we witness a new and peaceful North Korea? Will Trump’s deal-making skills become instrumental in promoting world peace? And specifically among Israel analysts: Will Trump be able to make a deal to solve the Israeli-Palestinian conflict? Firstly, when major changes happen in international politics it’s not due to specific characters and personalities. It is the accumulation of various circumstances leading to an urgency for change. It’s part of how nature works. As Kabbalist Yehuda Ashlag writes, “the duration of every political phase is just the time it takes to unveil its shortcomings and evil. While discovering its faults, it makes way for a new phase, liberated from these failings. Thus, these impairments that appear in a situation and destroy it are the very forces of human evolution, as they raise humanity to a more corrected state.” (The Nation). The newly improved relationship between the U.S. and North Korea is a positive step, and it sends a message to other countries that it’s worthwhile to relieve nuclear tension. Yet, I don’t consider it something that is bound to change the world dramatically. While North Korea has made a lot of noise, it is a secluded authoritarian regime whose global influence is very limited. In regards to implications on Israel, I believe we will see some gradual changes happening. 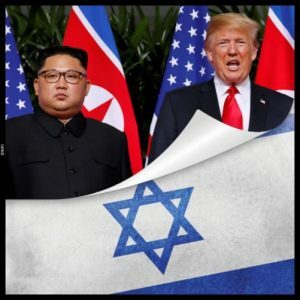 As the Trump-Kim relationship moves forward, we can also expect North Korea to stop the provision of weapons to countries like Iran and Syria. So, will Trump be able to extend his deal-making skills to the Israeli-Palestinian conflict and kick-start a dramatic change in the region? Unfortunately, I don’t see it happening. And once again, the reason has to do with nature itself. 3,800 years ago in ancient Babylon, a special “deal” was made at the cradle of human civilization. Representatives from the various groups, tribes and clans decided to come together and coexist under the principle of unity above all their differences. 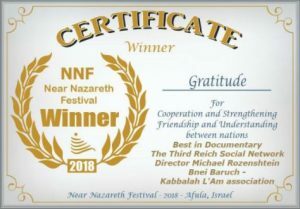 That group of representatives later became what we now refer to as “the people of Israel.” The deal is that they are like a central junction within the vast network of humanity, through which the influence of unity can spread to all nations, including Israel’s neighbors, whose actions depend on this influence the most. Therefore, solving the Israeli-Palestinian conflict is a different deal altogether. The only way to move from the current hostility into a state of friendship and coexistence, is when Israel generates the healing force of unity, first within itself and then onto the world. And as with all natural processes, the accumulation of circumstances will eventually lead us to the urgency for change. Question: What should we do when we discover negative qualities in ourselves that we did not previously perceive? How do we work with that? Answer: Don’t be afraid! The Creator reveals only your inner, true essence to you. Thank Him for everything that occurs. The revelation of the growth of egoism we call “rising along the left line.” Accordingly, you need to work with the right line in order to balance the left. When the left and right lines become very strong, relative to one another, between them, you will discover the Creator, the quality that controls you, and upon which you are entirely dependent. Uniting with Him, you will be able to affect Him and in this manner determine all your future states, your fate. How Can We Overcome Our Instincts? Answer: Happiness is a state in which I can fulfill others and fulfill the Creator through others. Question: The material world constantly pulls me in. Why did the Creator create it? Answer: He specifically created it so that it would pull you in, so that you would oppose it and try to act such that the upper world would pull you in. Question: What is the role of human diversity in this world? Answer: We are fragments of one general system of the soul, Adam, and therefore we are different. From this state, we need to connect together again into one common general system. Question: Is it possible to coax the higher forces so that I can be at the right time in the right place? Answer: It depends on a person’s destiny, which is determined according to many parameters, especially his soul, how much it was developed in previous states, and how much the general soul that is called Adam requires his or her participation in the general correction. Question: Do all the higher forces support us equally? Is it possible to create a connection with everyone? Answer: There is one higher power, the Creator, and the rest of these forces are derived from Him; therefore, it is necessary to take account of Him alone. All the rest of the forces are called Malachim (angels). They have no freedom of choice. Question: Do all Kabbalists have this dual perception of me and my egoism? Answer: That depends on what the individual associates himself with: the point in the heart or his egoism. If with one and the other, then he really feels himself in a dual state, divided into two parts. Question: Is this a good state? Answer: It’s very good! At any point in life, in any state, you hold onto the thought that you consist of two parts: one is the desire of your egoism and the other is your desire as a human being. At the very least, it is best to separate yourself from your egoism, to look as if from a distance, and convince yourself as to what egoists we all are. Juxtaposed with the good, realize what we can all be. However, egoism will not disappear, and we are not suffering from it in the least. We treat it completely objectively. This is a great, natural quality that helps you to rise higher. Who Can See The True Reality? Question: There is personal and general governance. How do they fit together? Answer: General governance descends on the people and the world, and personal governance descends on a person or his small community. At the same time, both types of governance may contradict each other. Remark: You said that the Creator does not relate personally to a man in any way, only through the whole of mankind. My Comment: It does not matter. If the Creator affects a person or if people want to selectively affect one another, then it is a personal impact. For example, in creating a mutual guarantee (Arvut), we want to selectively influence our friends. The Creator has no personal claims to a person. A person is a product of his environment, and therefore, the Creator treats him as a part of this environment. Question: Our body consists of billions of cells. Can I say that as I do not show my attitude to each cell individually and I cannot even discern them, in the same way, the Creator looks at us and does not see? Does He see only the general picture? Answer: The fact is that the general system is completely deterministic, interconnected. There is nothing in it to make it necessary to watch selected cells. We exist in the ideal world that from our perspective looks corrupted, egoistic. The problem of governance is to force us to reveal this ideal world. Therefore, general and individual impacts are connected to each other.